For over 20 years, Castlevania has been a steady performer. There have been dozens of games in the series, and they all share a lot of similar elements: themes, locations, monsters... they all repeat. A dark lord reborn, a castle that seems purposefully malevolent, a fight in a chapel, a climb up a clock tower, a brush with Death, a giant floating ball of corpses, et cetera. And in most cases, the hero of the game will be a Belmont. In most cases. The offspring of an unnatural union between Count Dracula and a human woman, Alucard possesses inhumane strength and dark magical powers. His weapon of choice is a sword and he uses a variety of them to serve his needs. He is an adept shapeshifter, commonly using the forms of wolf, bat, and mist to confuse and terrify his opponents. Alucard also relies heavily on ancient relics and magical items to perform elaborate magical attacks. Alucard was the protagonist of 1997's Symphony of the Night, the 13th Castlevania game - the first not to feature a Belmont in the starring role. In fact, part of the point of the game is Alucard trying to figure out exactly why there's no Belmont around to deal with the reappearance of the castle in 1797, a scant five years after it was last destroyed by Richter Belmont (as seen in Castlevania: Dracula X). Al wakes up from his demonic power-nap to see what's the matter. NECA's Castlevania line was first shown off in 2007, and released near the end of that year. But it was hugely underproduced, so only a very limited number of toys were available. In 2009, however, NECA went back into production, and this time the figures were (comparatively) easy to find. Of course, one area's pegwarmer might as well have been a chase elsewhere, so there was still no guarantee you'd find the figures you wanted. 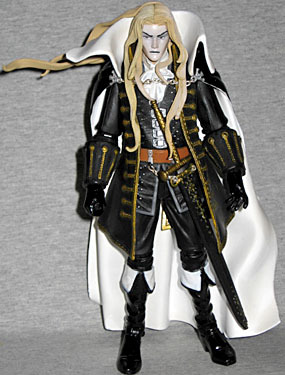 Alucard is 7¼" tall, and is less gaunt and angular than the SotN artwork depicted him. Of course, since he was only a 2D sprite in the game, we can't compare the figure to that. Yes, it's considered one of the best sprite designs of all time, but you still can't stand that next to a fully sculpted figure and expect to compare details. His face is shorter, and has something of an anime look, and his hair reaches his waist - other than the ponytail, which sticks out to the side. Al is wearing an ornate black coat with gold trim. The cuffs are folded over, and are large enough to reach his elbows. 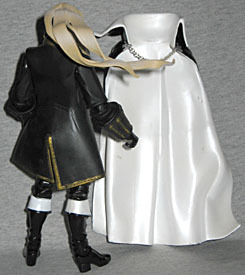 His gloves and boots are gloss black, suggesting patent leather, and he's wearing a white cravat. He has a thick red belt, and four huge silver buckles on his waistcoat. Finally, there's a massive cape hanging on his shoulders, clasped by a real metal chain. The paint is good, but there are some problems. 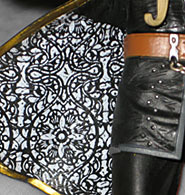 The coverage on the figure is okay, and there's a complex pattern in the lining of his coat. The pearly white folds on his boots need better coverage, and the interior of his cape - also white, but flat, not glossy - takes scuffs way too easily. A perfect 18th century fop, Alucard is wearing heavy white makeup: you can tell when you pull back his hair and see the normal pink fleshtone on his neck and cheeks. His upper lip is painted black, and he even has dark eyeshadow. Fancy! Fortunately, it's all painted with a beautiful level of skill - no errors worth mentioning. As you can see, it's possible to remove the cape. All you need to do is pop off one of the clasps and slip the piece off. It doesn't plug into the figure at all, so there are no unsightly holes or glue marks. It rests on his shoulders, and is held in place with some help from his hair, so if you're careful, you can remove the cape and get it back on without anyone being any the wiser. The ponytail may pop off, and that you'll have to glue. No big problem. Heck, you might want to leave it off - he'll still look fine from the front. 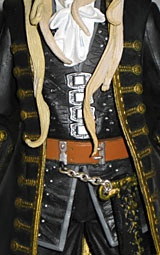 Alucard comes with his sword, which can either be clutched in his right hand, or sheathed in the scabbard hanging by a real chain from his waist. That's the only item specifically intended for him, but not the only one he comes with. There's also a cross on a chain, a vial of Holy Water (complete with sculpted bubbles in the water; no wonder it was nominated for a ToY Award!) and a shank of meat - the Castlevania series' health-restoring item. The meat [no, not The Meat, sadly --ed.] rests on a silver plate, has an exposed bone, and is a toasty brown on the outside, while being bright red on the interior. I hope you like your werewolf drumsticks super-duper rare! The reason that NECA has continued to be a viable company while McFarlane Toys has been slowly swiftly circling the drain of irrelevance is a simple one: articulation. Todd never understood what makes a toy worth buying, while NECA quickly learned what people want. The Succubus might be a statue, but Alucard has joints at the neck, shoulders, elbows, wrists, waist, hips, knees and ankles. Everything but the waist and wrists (both locations are swivels) have the range of balljoints, so poseability is decent. However, it's not as good as some of NECA's other videogame toys, because the cape and coat limit the range in the legs, and the design of the elbows means you can't even get a 45° angle out of them, let alone 90° or above. The knees are the same way, but it's less apparent there. Even outside of Castlevania, the name "Alucard" is generally accepted as either the name of Dracula's son, or an alias used by Drac himself. Many people believe it's part of the original myth. But nope, it's a recent creation - pre-existing this Alucard, but definitely not all that old. In fact, it was our old friend Curt Siodmak who came up with the name. Well, as much as you can "come up with" something that's merely the existing name turned backwards. Anyway, just like he gave us the modern werewolf and the brain in a jar, he gave us the name Alucard in 1943. 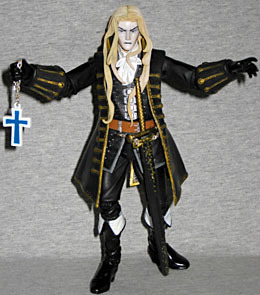 This figure is just following in that tradition, even if many of the folks who will buy it have no idea of Alucard's true lineage.